Compared to last year, the first quarter sales results of 2019 (Jan Feb Mar) show that the number of single family homes sold is down by 24%, home sale prices are down by an average of 7% and days on the market is up by 42% to 51 days. The overall sale price of a single family home was $595,046 during the first 3 months of 2019. The Qualicum Beach Parksville Nanoose Bay Fairwinds Bowser Deep Bay area real estate market in 2018 started to cool off after a spectacular run that began in 2016. Prices have been rising by double-digit percentages since then: 2016 up 19%; 2017 up 14%; 2018 up 13%, year over year for single family home sale prices. For 2019, the trend may be that home prices are stabilizing or levelling off somewhat in response to a 22% drop in the number of single family home sales in 2018 compared to 2017. A similar trend occurred in other markets over 2018 such as in the Lower Mainland, where sales have slowed but prices have held steady. For instance, the 2019 predictions for the Vancouver real estate market is such that RE/MAX predicts a 3% drop while Royal LePage predicts a 0.6% rise in prices. Here on Vancouver Island the BCREA predicts a 10.4% increase in pricing. The real estate market in the Qualicum Beach Parksville Nanoose Bay Fairwinds Bowser Deep Bay area has levelled out and shifted towards a more balanced market over the summer and into the fall. In November, about 20% of listings sold in 1 week with about 50% selling in under 1 month. This is slower than it has been. We see a great gray wave of Boomers (more like a gray tsunami...) retiring to the region. At RE/MAX Anchor and RE/MAX First, our full-time REALTORS have the highest number of sales per REALTOR when compared to our local competition. Outstanding Agents...Outstanding Results. Balanced Conditions Prevail in BC Real Estate Housing Market. The British Columbia Real Estate Association (BCREA) reports that residential unit sales across the province were down by 26.2% compared to the same month last year. The average residential price in BC was down 4.1% from October 2017. Total sales volume showed a decline of 29.3% from October 2017. The BC housing market continues to grapple with tougher mortgage qualifications in October. However, more modest consumer demand has led to a much-needed increase in the supply of homes for sale, said Cameron Muir, BCREA Chief Economist (November 12, 2018). The Qualicum Beach Parksville Nanoose Bay Fairwinds & Area real estate market shifted towards a more balanced market over the summer and now into the fall of 2018. Local home sales continue at a slower pace compared to last year. This bodes well for buyers. Contact Tom to find out more. For an informative update on the current real estate market in the Qualicum Beach, Parksville, Fairwinds, and Nanoose Bay areas of Vancouver Island, listen to Tom Whitfield's radio interview, on August 25, 2018, on CKNW 980 AM MoneyTalks hosted by Victor Adair. Click the Read more link below for the full audio. The Qualicum Beach Parksville Nanoose Bay Fairwinds & Area real estate market has seen a shift towards a more balanced condition over the July, June & May period. The number of single family home sales has dropped by 30% with sales dollars down by 18% compared to the same period last year. The number of listings of single family homes is up by 35% compared to last year while the number of listings among all types of properties is up by 23%. It appears as though we may have begun a trend towards more balance between supply and demand, causing less upward pressure on prices. In May, the overall number of listings was up by about 20% over May of last year. It appears as though we may have begun a trend towards more balance between supply and demand, causing less upward pressure on prices. It's important to price your property competitively given the shifting dynamics in the real estate market. Forests are in the process of re-organizing themselves to a new set of conditions. See the link to today's PQB newspaper story Trees are Adapting to Climate Change. Walk the Heritage Forest trails in Qualicum Beach and take a break from real estate. See the link to today's PQB newspaper story Heritage Forest Trails. For an informative update on the current real estate market in the Qualicum Beach Parksville Fairwinds Nanoose Bay area of Vancouver Island, listen to Tom Whitfield's radio interview on CKNW 980 AM Moneytalks hosted by Victor Adair. Click Read More before for the full audio. 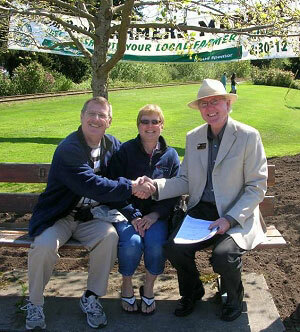 This is a letter of gratitude to Anne Klees, Tom Whitfield and the town council of Qualicum Beach. Congratulations to you and the countless volunteers and donors who were impassioned and allowed the Heritage Forest to stand. Qualicum Beach Parksville real estate is being taken up quickly by Lower Mainland buyers who have arrived, en masse. Pre-school Munchkins recently planted trees in the Heritage Forest. Shown here are Tom Whitfield of the Brown Property Preservation Society with Munchkins Finnley and Zachary Doerksen, and their mom Evelyne. The Brown Property Preservation Society, with me as President, invited them to plant a few trees. This was the very first day of the Preschool Munchkins going out into the community to explore nature. So I thought it would be great to have them plant a few tree seedlings. Seven ways to show off champagne taste even on a Baby Duck budget. Conjuring a luxury kitchen takes ingenuity when the finances just don’t measure up. But spotlighting a few areas can really boost an uninspiring kitchen. House Beautiful has these tips. Kids standing on a 5 foot Douglas-fir stump in the Heritage Forest, Qualicum Beach. Tom has asked the kids to create a 500 year old historic timeline which will be displayed on the large slabs cut from this stump in the Heritage Forest. It will eventually be on display at the kiosk in the Forest. Tom explaining to the kids who are going to do a 500 year-old timeline project for the Heritage Forest in Qualicum Beach. Nice break from selling real estate in Qualicum Beach while doing some good work with cheerful volunteers in the Heritage Forest. Another great day to sell real estate here in beautiful Qualicum Beach on Vancouver Island, BC. Today's Baby Boomer real estate estate buyers take their time and make decisions carefully. They will peruse their options, seek out the best value and do their research. They are not an easy sell. For them, it is about settling in for retirement. For many, it is about down-sizing. Although Boomers still want space, luxury with quality finishing, good decks and/or patios for outdoor relaxation and entertaining plus always...a great kitchen! Watch this new RE/MAX real estate video. Here's a parable about Life... Three Stonecutters - One day a traveller, walking along a lane, came across 3 stonecutters working in a quarry. Each was busy cutting a block of stone. Interested to find out what they were working on, he asked the first stonecutter what he was doing. Here is an interesting article Vancouver Sun article on Older Population "active Third Age" Baby Boomers impact causing innovative urban planning. Watch this with your morning coffee to get you revved up! Get You Started!. This fast-moving video highlights the success of REALTOR.ca in each province while featuring some gorgeous images from across the country. The scenery is quite good and I thought you might enjoy taking a look. Certainly 2012 was a record-breaking year for use of REALTOR.ca across Canada. VOLUNTEERING - Many people believe they don't have the time to get personally involved or that they have nothing to offer. Everyone has something to offer. Some of you may be interested to know that we have had a family of Great Horned owls in the west side of the Heritage Forest here in Qualicum Beach. We have been seeing 1 adult with 2 chicks. Now the chicks are about 1/2 the size of the rather huge adult. There are always several Barred owls in the eastern portion of the Forest but the Great Horned owls are new, at least in recent times. Seems they have their territories worked out. It's worth noting that the rabbit population in the neighbouring residential area has been thinned out significantly. Hey, biological controls! See you in the Forest.